The pest control of any stored product involves many steps, primary of which is discovery of infested food items or other sources of infestation. All dried food products need to be inspected for signs of infestation. In any situation you need Eudaimonia Pest Control consulting you about the stored product pest problems you are experiencing to eliminate infestation and prevent future stored product pest issues. Eudaimonia's pest control specialist will conduct a detailed inspection, focusing on production and storage areas. Then we will physically remove any infestation we uncover, apply residual products and insect growth regulators to provide lasting protection, and install pherormone monitors to alert us to potential for new activity. Eudaimonia's pest control methods can eliminate any stored product infestation and provide a safe environment. Pests in stored products can refer to any organism that infests and damages stored food, books and documents, fabrics, leather, carpets, and any other dried or preserved item that is not used shortly after it is delivered to a location, or moved regularly. Stored product pests are responsible for the loss of millions of dollars every year in contaminated products, as well as destruction of important documents and heritage artifacts in homes, offices, restaurants, food processing establishments and other important properties. 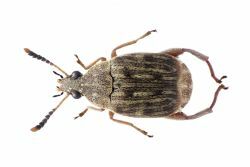 Many of these pests are brought indoors in items that were infested when purchased. Others originate indoors when susceptible items are stored under poor storage conditions, or when stray individual pests gain access to them. Storage pests often go unnoticed because they infest items that are not regularly used and they may be very small in size. 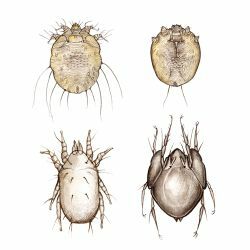 Infestations are noticed when the pests emerge from storage, to disperse or sometimes as a result of crowding or after having exhausted a particular food source, and search for new sources of food and harborage. 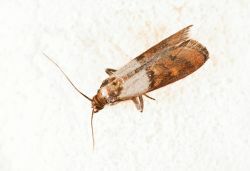 Unexplained occurrences of minute moths and beetles flying in large numbers near stored items, or crawling over countertops, walls and ceilings, powdery residues below and surrounding stored items, and stale odors in pantries and closets can all indicate a possible storage pest infestation. Infestations in stored whole grains or beans can also be detected when these are soaked in water, and hollowed out seeds rise to the surface, along with the adult stages of the pests, and other debris. Other telltale signs are clumping or webbing of particles. It is important to recognize these pests and locate the sources of infestation as soon as possible, to prevent their establishment and spread. 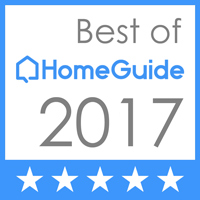 This section will cover insects and mites commonly encountered in storage and these can be broadly grouped into stored food (or pantry products), and stored fabric (or closet) pests. 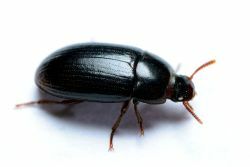 However, many of these pests are not restricted to either group and will infest food, fabric, as well as many other similar items of plant or animal origin. Pests of stored food/pantry pests are grouped into insects (beetles, moths) and non-insects (mites). However, large infestations can significantly alter the appearance, taste, flavor and quality of food, as well as create favorable conditions for growth of secondary fungal and bacterial pathogens. Allergic reactions can be produced in sensitive people. Certain general pests such as ants are often attracted to food stored in pantries and may be toxic if consumed in large numbers.